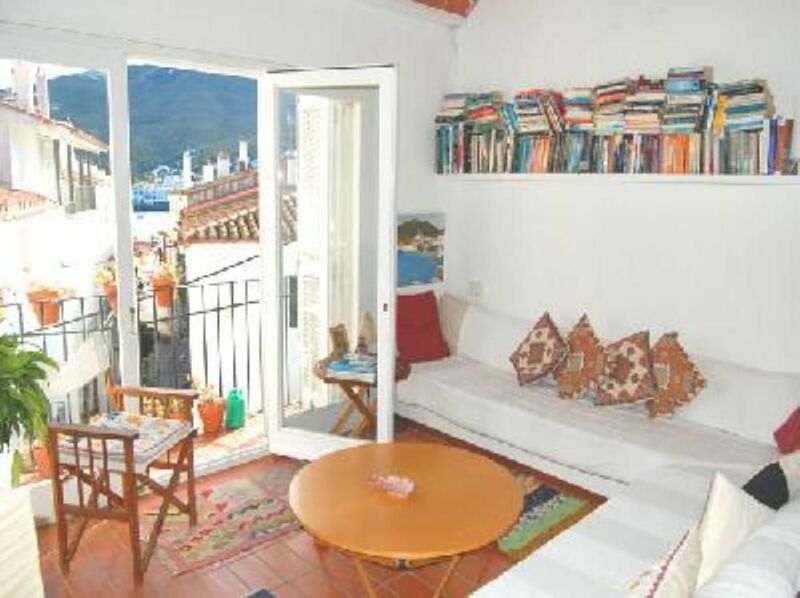 Modern top-floor apartment (two storey house) centrally located on the sunny side of Cadaques. It has sun all day and a magnificient view over the tiled roof tops to the sea, church and old town and to the mountains beyond. The apartment, for up to 4 people, is well designed, with a spacious living room and integrated kitchen, and two bedrooms (one with a double bed and the other with two single beds), plus bathroom with bathtub and shower attachment. The living room has floor to ceiling windows giving on to a French balcony with seaview, and is equipped with a CD player and a large library with books in several languages. The kitchen is fully equipped with vitroceramic electric stove, microwave oven, oven, fridge, cooking utensils, washing machine, etc. The apartment is very centrally located, a 2 minute walk to the beach and a 5 minute walk beside the sea to the main square, bars, restaurants, shops and supermarket. You can park in the streets behind the apartment. Cadaques, is a beautiful old Spanish fishing village. It became the home to the famous painter Salvador Dali, whose house-museum you can visit . Today Cadaques is a charming seaside village renowned for its lack of highrise buildings, and its vast stretches of unspoilt coast ideal for swimming, scuba-diving and boating. It is surrounded by Cap de Creus natural park, with low mountains ideal for hill-walking all year long. Minimum stay is 4 nights in July and August and 3 nights the rest of the year. We had a lovely week in Patricia's apartment, which is just a minute down to the water. It's great to have a little view to the water and the roofscape of the town, and the apartment was very functional and cheery. We would stay again! Lovely to hear David and hoping to welcome you back to Cadaques sometime in the future. We walked, swam, enjoyed good food and drinks and the sun, a lovely stay. We had a lovely stay in this apartment. The apartment has a real traditional feel to it and is not modern but it was clean and comfortable and It had everything we needed for a relaxing stay in beautiful Cadaques. The apartment is located about a 2 minutes walk down a narrow cobbled street to the nearest bars and restaurants and its location is perfect for exploring Cadaques and Port Ligat. We would definitely return to Cadaques and would stay at this apartment again. We had a very rest full time, easy walking to all of that which Cadaques has to offer. We went to restaurants Patricia recommended, wonderful local knowledge! Parking is a challenge, however look for parking around the park at the top of the stair. We thoroughly recommend Patricia's little piece of Paradise. After a very busy time it was really relaxing staying in Cadaques. We love this town so much. We felt confident to let our children (9 and 11) go to the beach fishing and sailing on their own. The traffic in Cadaques is slow and the whole environment feels so safe. We enjoyed the apartment. It is perfect! For us. Perfect location with view on the bay. Perfect size. Perfect equipped. Only one regret: we had to leave too soon. Hope to be back soon! Thank you for sharing your lovely apartment with us! "Fine city. A fine quiet place. Excellent apartment, it is close to the sea. A beautiful view from the window, around tile roofs..... dream." Cadaqués is 45 minutes from the French border, with airports at Barcelona (2 hours) and Girona (Barcelona-North, 45 mins), and in France at Perpignan, Montpellier and Toulouse. Train station in Figueres and regular daily bus service from Barcelona, Girona and Figueres. Tourist information provided in the apartment.